This delicious Teriyaki & Garlic Rice evokes the very best of Japanese cuisine. 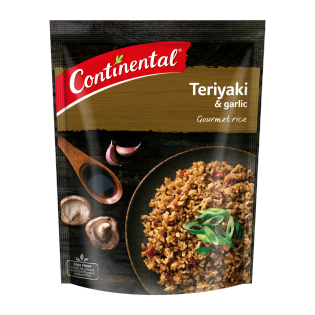 Rich in authentic teriyaki flavour with a kick of garlic, every mouthful is bursting with gourmet flavours. For a little something extra stir through some sliced char-grilled beef fillet and green beans and top with spring onion and toasted sesame seeds.